This Lovejoy Econoline spring pulley with an A/B belt section is made of cast iron and comes with one groove. It is a classical V-belt, spring pulley that fits a variety of widely available, classical profile V-belts and is suitable for use in many existing power transmission drives including conveyors, mixers, and small machine tools, among others. 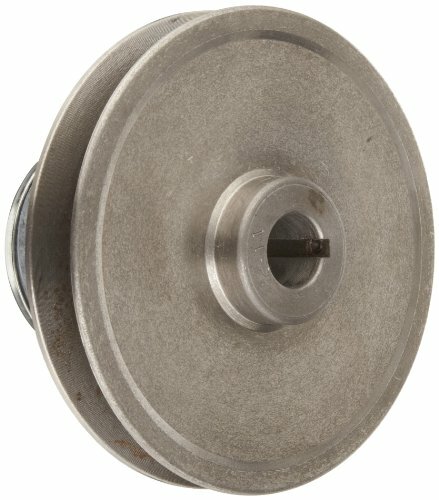 When this spring-loaded pulley is mounted on the drive shaft in a drive design, horsepower remains constant throughout the speed range as speed increases and decreases. This pulley is made of cast iron for resistance to wear, corrosion and galling. It has an A/B cross section and one groove for use with single belts. V-belt pulleys (sheaves) are used in a wide range of mechanical and electronic drives, including HVAC units, farm machinery, food processing equipment, and home appliances, among others. V-belt pulleys (sheaves) are the component in a power transmission drive that transmits power to the belt. Typically made of cast iron, the pulleys and the V-belts that loop around them match in form – wide (classical) or narrow, single or multi-grooved. V-belt pulleys are found in drive designs in the agriculture, textile, printing, mining, and office equipment industries.